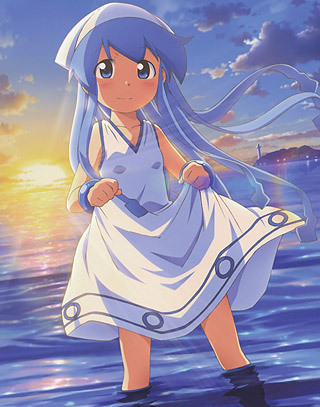 Squid Girl is one of those anime where it's fun to just spell out the premise. "It's about a half-girl, half-squid from the sea who comes to invade the surface world to get humanity to stop polluting the ocean, only she ends up working as a waitress at a noodle shop because she's afraid of this one girl who knows karate." Try to explain this to people who aren't very familiar with anime, and watch them swear that you are making it up and that this summary could not possibly describe a real show. 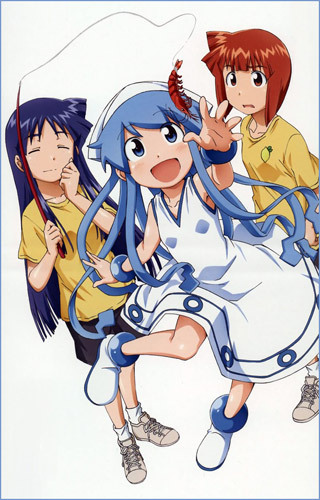 The more anime-savvy will probably believe that Squid Girl is a real show, but they'll still look at you a little funny. However, despite wearing its impressive level of silliness on its sleeve, the show is actually a consistently enjoyable comedy series. While a capsule description gives you an idea of how over-the-top and fun the series can be, what may surprise viewers is how much the charm of the slice-of-life genre pervades the show. 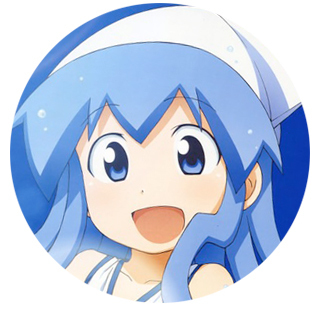 Squid Girl may be an "invader", but she's also a naive young girl who's experiencing many things for the first time. By chronicling the title character's introduction to life on the surface world, the show shares much in common with series based on the idea of rediscovering the wonders of the world through the eyes of a child, like Bunny Drop and Yotsuba&! 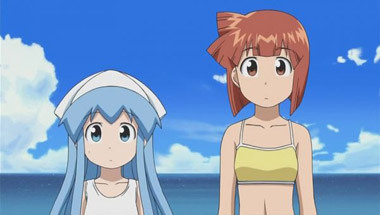 Most of the action takes place at the Lemon Beach House, where Squid Girl must work as a waitress to pay off a debt for blowing a hole in the shop's wall on the first day of her invasion. 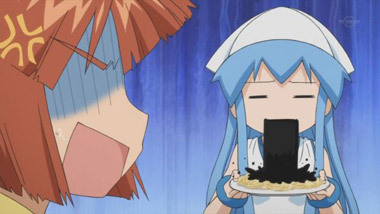 Run by the Aizawa sisters, sensible Eiko and scary Chizuru (who's inexplicable martial arts superpowers keep Squid Girl in check whenever she starts getting serious about invading), the shop is only too happy to make use of Squid Girl's ability to spit edible ink, leading to a popular pasta dish. Other squid-powers the blue-haired waif possesses include the ability to stretch her tentacles to great lengths and pick up objects with them (very useful for waitressing) and glowing in the dark. 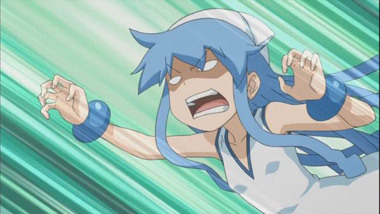 A lot of the appeal of the series comes from Squid Girl herself, who considers herself a threatening super-villain but couldn't be more harmless if she tried. 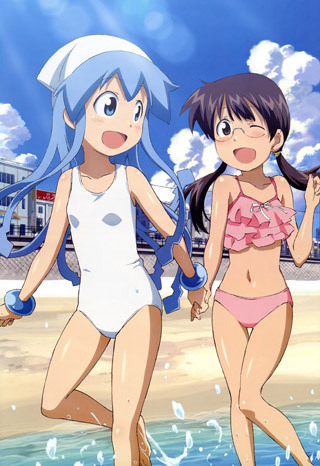 Other characters, like a lifeguard with a friendly rivalry with Squid Girl and a group of scientists who try to find proof that Squid Girl is an alien life form, provide lots of comedic fodder for our heroine. 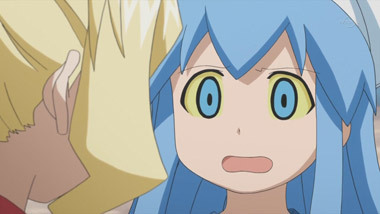 We weren't so keen on Sanae, Eiko's friend who develops an all-consuming obsession with "Squiddie" and begins stalking her, just because we're getting kind of tired of the stalker-character type in recent anime; is stalking really that funny? Still, Sanae's imagination is responsible for the especially adorable "Mini Squid Girl" segments, so we owe her at least that much. 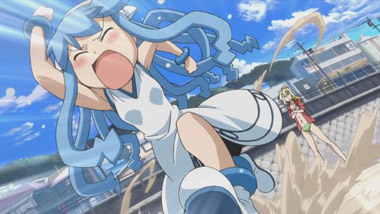 Perhaps the best part of the show is the fact that with the exception of a few characters, no one who frequents the beach around Lemon Beach House seems to find Squid Girl's appearance and powers at all strange, even when she uses her tentacles to deliver killer spikes in beach volleyball tournaments. 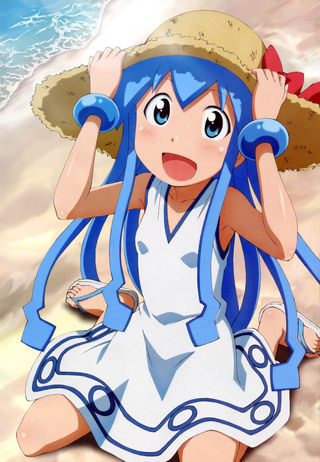 It's not that her marine origin is a secret; Squid Girl isn't exactly quiet about it. It's more like everyone around knows that she's a thus-far undiscovered human-squid hybrid, and they just sort of shrug and go with it. Apparently, that's just how they roll at Lemon Beach House; we want to live where everybody is this laid-back. 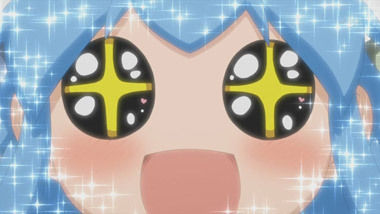 Production-wise, the animation is up to the task of portraying our favorite squid in all her glory. 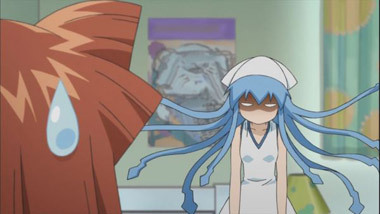 Squid Girl's tentacles aren't always moving, but when they are, they're consistently well-animated; we liked trying to keep track of what all her tentacles were doing at once just for the heck of it. This isn't a series that will entice you to purchase the soundtrack immediately, but the cheerful first opening theme, Let's Invade!, suits the series extremely well. Everything about the show seems to be light, pleasant, and refreshing. 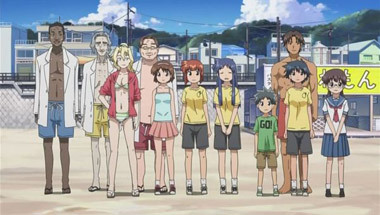 In addition to all its other merits, this show has the incredible distinction of being a series that takes place at the beach 90 percent of the time, featuring many female characters who often wear swimsuits, with virtually no fanservice. How is that even possible? We're still trying to figure it out. 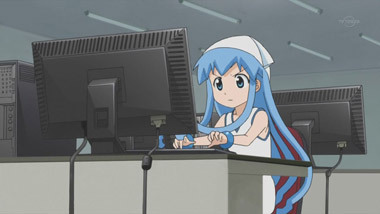 As of this writing, Squid Girl is available streaming on Crunchyroll. The series has also been licensed by Media Blasters and is now available on DVD; pick up a copy, and be a part of the world's cutest invasion. 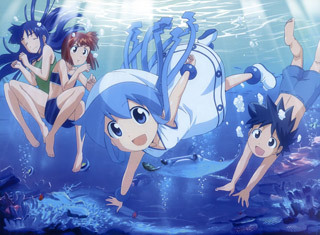 Below: Scenes from Squid Girl. 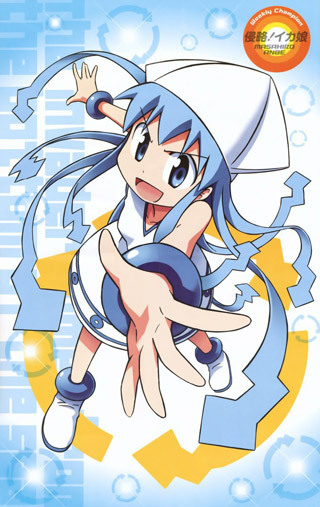 Below: Promotional illustrations for Squid Girl.